Will the person you love ever get better? Chances are you've grappled with the question. 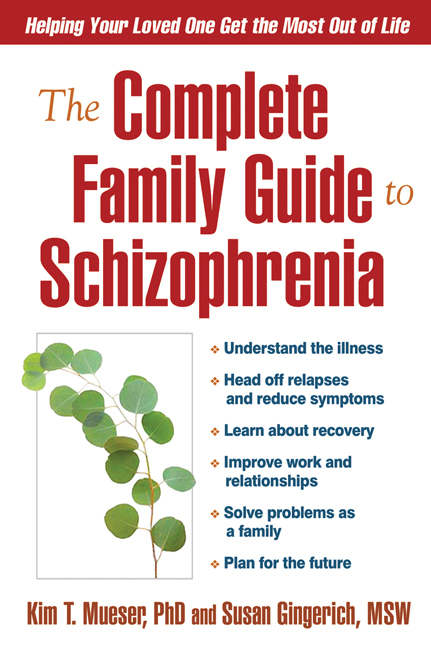 With care and support from their families, people with schizophrenia can and do make vast improvements. Noted therapists Kim Mueser and Susan Gingerich deepen your understanding of the illness and cover a wide range of effective treatments. Based on decades of research and experience, they offer pragmatic suggestions for dealing with depression, psychosis, and other symptoms. They show you how to prioritize needs, resolve everyday problems, and encourage your loved one to set life goals. Plus, individual sections highlight special issues for parents, children, siblings, and partners. Whether you’re facing schizophrenia for the first time or you’ve dealt with its impact for years, you’ll discover innovative ways to handle challenges that arise over the course of treatment, from reducing the chances of relapse to making friends and finding work. Recovery isn't an endpoint—it's a lifelong journey. With love, hope, and realistic optimism, striving for it can lead to a richer, more rewarding life for your entire family.